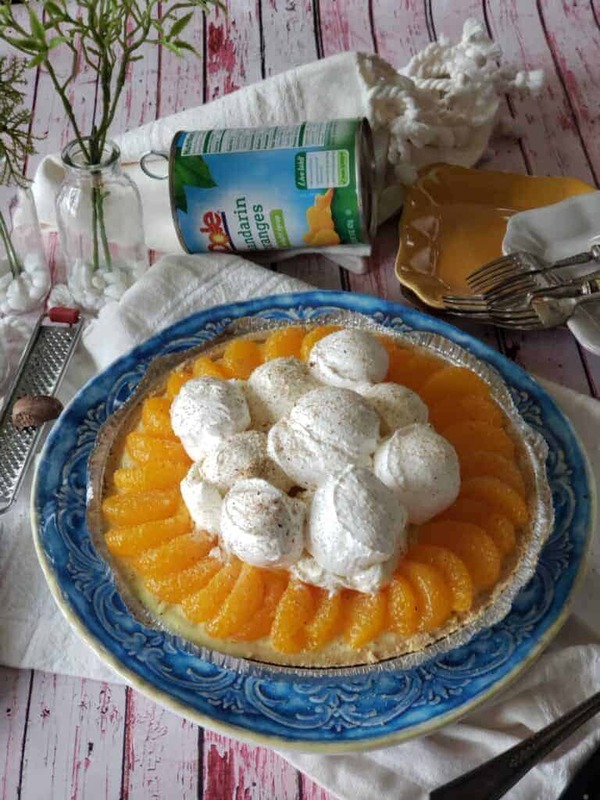 Thanks to Dole Packaged Foods for partnering with me for this mandarin vintage no bake pie! I am the creator of this recipe and for the description and information that follows. For a full disclosure, click here! Who doesn’t love something simple, easy and with just a few ingredients and the end result is something just spectacular! 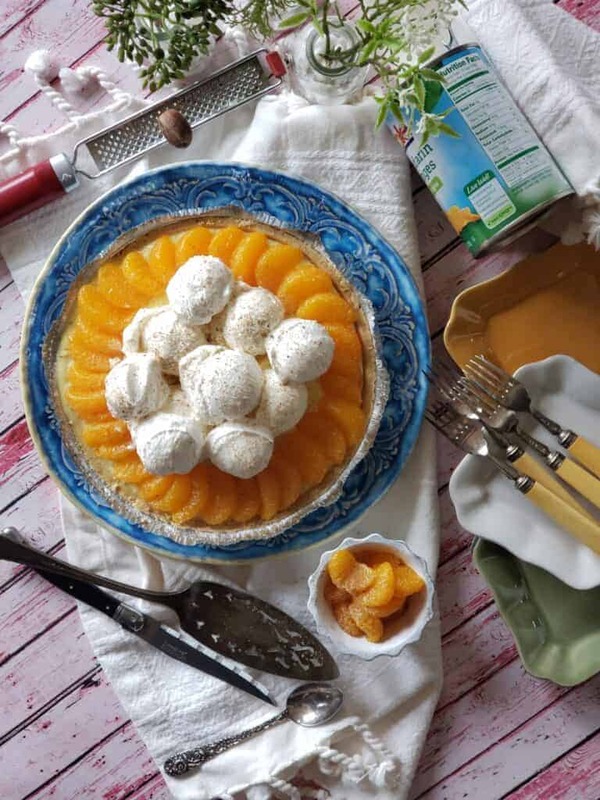 This mandarin vintage no bake pie is a takeoff on so many other flavors and type of ‘no bake pies’ that are out there in cyberspace. 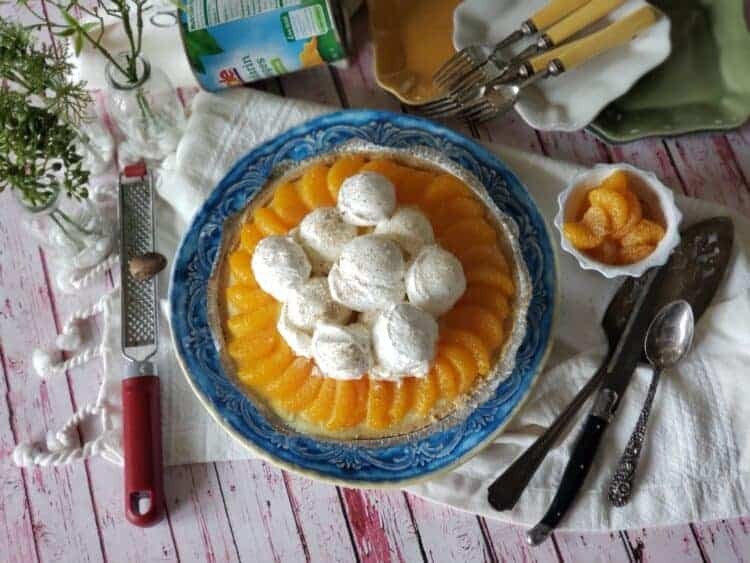 And, with these juicy tender always perfect mandarin slices mounded on top with the cool whip, well, you’re just going to want to go back for seconds! Dole’s mandarin oranges come frozen, jarred and in cans. All are simply divine and delicious. And, all can be used for so many more things, both sweet and savory, in cooking. They’re all natural fruit, non-GMO and a good source of vitamin C. The peel back tab lid on the cans make it easy to open, and they come in both 15 and 11 ounce sizes. You’re going to use everything in this can, the light syrup and the mandarins. In fact, I’d suggest you have two cans because I found that when serving the pie, my folks wanted even more mandarin bites than were on a slice. And, of course, you want to dust these mandarin slices with freshly grated nutmeg. Oh, the sparkle to the flavor! This pie is so simple to make. It requires virtually no baking or pastry skills other than following the directions. Make it in the evening. Add the mandarin orange ring, then cover and let it chill over night. When you’re ready to serve it, dollop on the whipped topping. Or if you want to get fancier make your own whipped cream. Serving with vanilla ice cream also would be fabulous! Drain the mandarin oranges. Reserve the liquid. Put the mandarins in a small bowl and put in the refrigerator. Put the mandarin juice in a sauce pan and bring to a low boil. Whisk and dissolve the lemon jello in the liquid. Put the cream cheese in a medium size mixing bowl. Pour the hot juice/jello mixture into and using a hand mixer, blend well into a frothy mixture. Pour this mixture into the chilled crust. Return the pie to the refrigerator and chill until set. When the pie is set, arrange a ring of mandarin oranges around the perimeter. Zest nutmeg on the mandarins and pie. Use a spring scoop to dollop cool whip in the center. Give another dusting of nutmeg on the cool whip. Refrigerate until ready to serve. Put remaining mandarin oranges, zested with nutmeg, in a small bowl when serving. This pie keeps well refrigerated for about two days. Cover pie with plastic wrap and refrigerate. If you want to add the dollops of cool whip when ready to serve, that works, too. 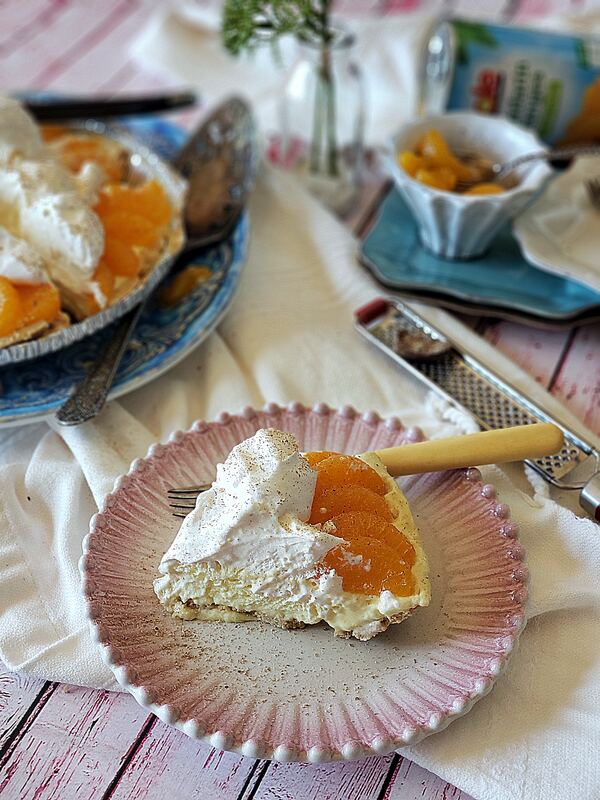 Serve extra mandarin oranges zested with nutmeg with pie.